Across various social media platforms, ‘Altitude masks’ are becoming a regular feature in shots of athletes training in different sports. 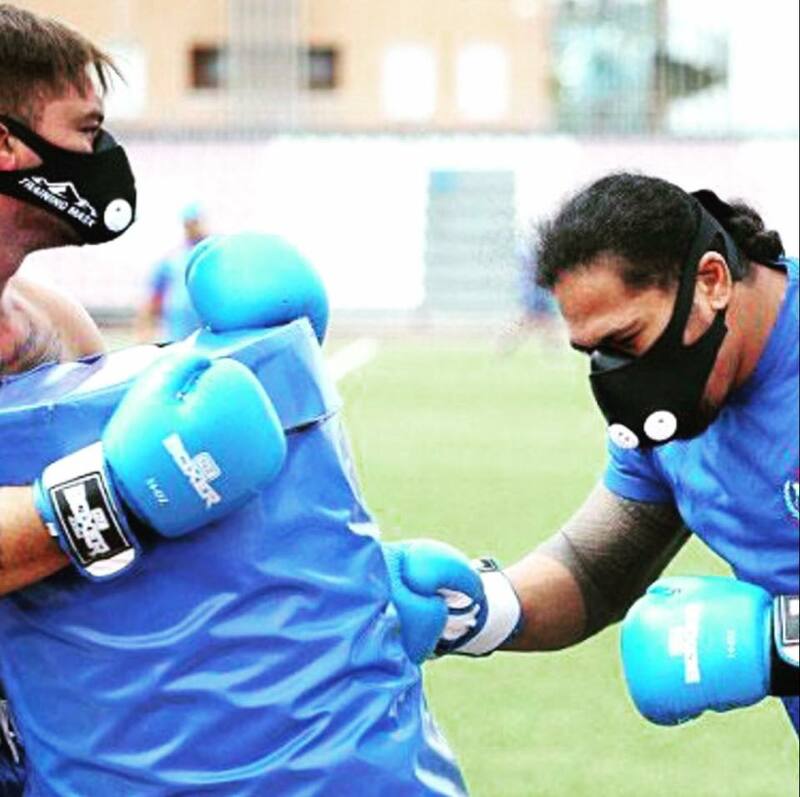 Samoa’s national rugby union team have used them during their world cup preparations, the mask is featured in the upcoming Rocky movie “Creed” and is commonly used by boxers and combat athletes. But what are the benefits? What does the research say? Team GB Boxing physiologist Laura Needham investigates and explains the functions and benefits of altitude training masks. This is the third part of our series on altitude training. So is wearing an ‘altitude’ mask beneficial for boxers and does it do exactly what it says on the tin? What are the claimed benefits of the altitude masks? Type ‘altitude masks’ into Google and there is an abundant of websites claiming all sorts of physiological and psychological benefits from training with an altitude mask.. There are a number of cardiovascular (heart and lungs) and peripheral (blood and muscle) adaptations from training at altitude. Generally, the main reason athletes go to altitude training camps is so the body produces more red blood cells, which increases aerobic fitness. However, this is not a benefit you will gain from using the altitude masks. This is the effect on Sam Sheedy during a session in our altitude tent, read more here. Any of you that have tried the mask on will know that straight away it is harder to breathe. The mask works by restricting your air flow, as you are breathing against a resistance. In comparison, when you breathe at altitude the air is free flowing. As Gareth previously mentioned, there is not actually less oxygen at altitude, but the barometric pressure is lower (read more here). As a result, the masks do not generate lower oxygen concentrations in the air when you inhale. Instead they use mechanical valves to breathe against a resistance on inhalation which works your respiratory muscles; diaphragm and intercostal. This type of training is known as inspiratory muscle training (IMT), a good way to view it is strength training for your respiratory muscles. There is one similar response between the mask and training at altitude, which is the fact that breathing is harder. A physiological consequence of this is decreased arterial oxygenation in the body (SaO2). However, these are a result of two different mechanisms. With the mask, there is some evidence to suggest that the hypoxemia (reduced oxygen in the blood) is caused by the rebreathing of expired carbon dioxide that has accumulated in the mask’s large dead space area. Essentially you are rebreathing the by-products that your body is trying to get rid of. In addition, your respiratory muscles require more oxygen due to extra mechanical work required to pull in the air through the resistance of the mask. There is a potential that your respiratory muscles are ‘stealing’ the oxygen from your working muscles. Watch a short video on how we use the altitude tent at Sheffield Hallam University. Click here to read more. What might the masks be beneficial for? One benefit you may gain from using the training masks could be the strengthening of your respiratory muscles (Inspiratory muscle training IMT). However, this could be at the expense of your training session; you may not be able to push yourself as hard or for as long when wearing a mask. There are other products on the market (PowerBreathe) which you can strength train your respiratory muscles at rest. Furthermore, this would not interfere with the quality of your training sessions, which can be argued is the most important factor of training. The training is the must have and the IMT is the nice to have. The training masks on the market claim to ‘simulate altitude.’ However, they do not replicate the systemic effects of altitude across the body, it is localised to the respiratory muscles. The mask works by restricting the air flow from your mouth to your lungs by breathing against a resistance. The altitude mask could limit your training session quality, so think carefully about what you feel is limiting your boxing performance fitness or respiratory strength. Inspiratory muscle training could be a potential benefit from the masks, however, there are other ways to do this which would be more controlled and not interfere with training session quality and quantity. Like this article? To learn more about sport science in Boxing, sign up to our mailing list and receive our e-book ‘Punch Harder’ for FREE.